It's Friday Afternoon. 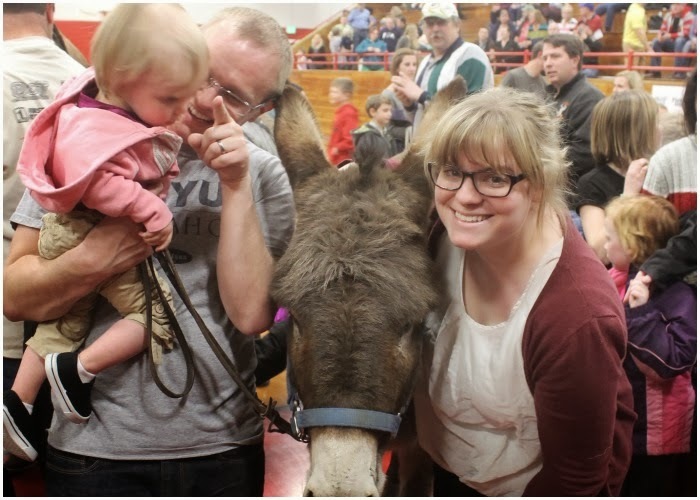 Drew comes home from work and announces "Tonight is Donkey Basketball and I think we should go!" I grew up in a city of 60,000 people. 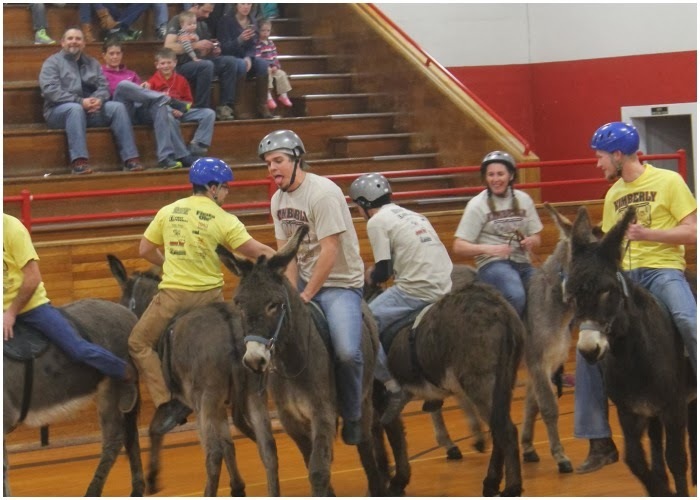 I had 800 kids in my graduating class and we never, never, ever had a thing called "donkey basketball". I was sure Drew was pulling my leg. I thought for sure this was one of those times where he was teasing me and after he had convinced me it was real, he would come back a couple hours later and say, I was totally kidding, I can't believe you fell for it kind times. After two hours, I finally told him I would believe it when I see it. We first we to dinner at this cute, local pizza buffet. 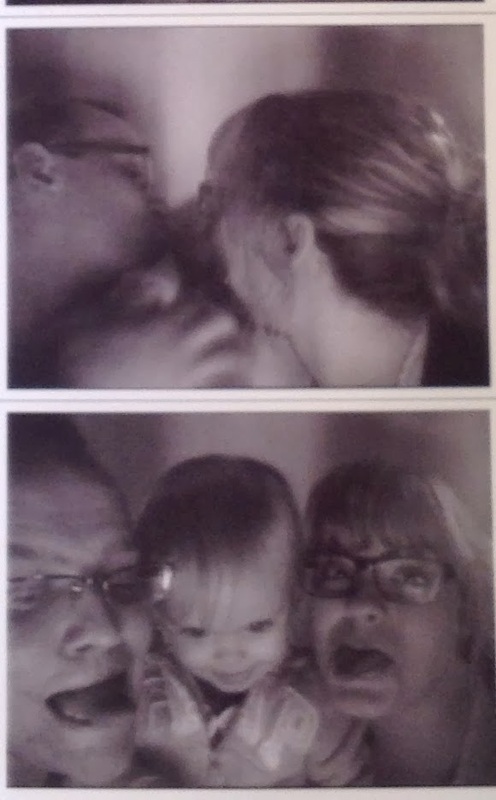 I gave it a thumbs up, plus it had a little photo booth there so of course we took advantage of it! After dinner, we drove over to the gym. We walked in, heard some kids say "Hi Brother Wright!" (I love when he gets recognized around town by his students.) 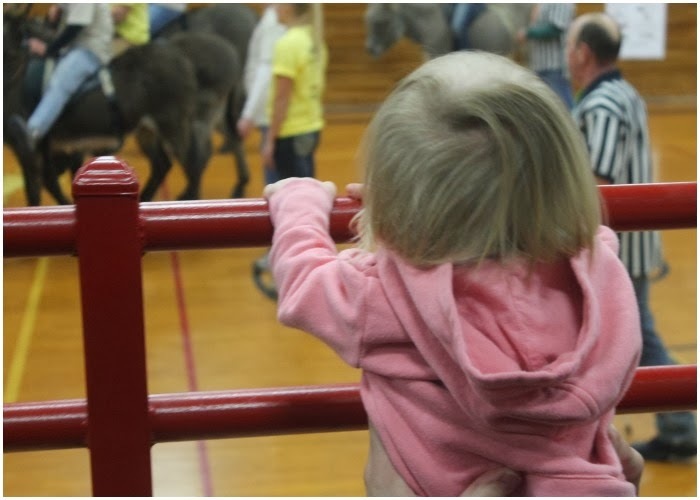 We found our seats and a few minutes later they brought the donkeys in. 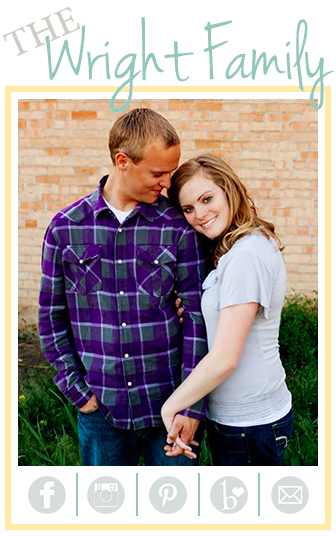 You guys, this was probably the funniest (most funny?) thing I have seen in a long time! They rode donkeys and played basketball. It was nuts! Some donkeys wouldn't move, other donkeys booked it down the court it was hilarious! 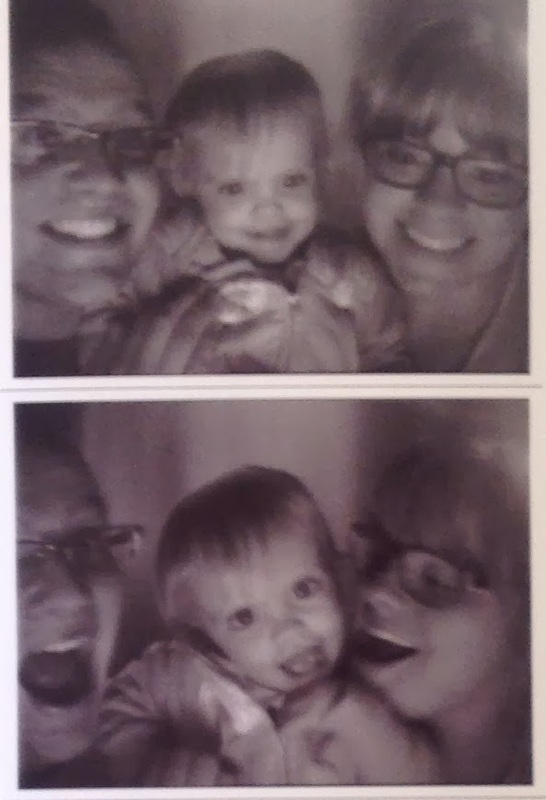 Abbigail was entertained the whole time! 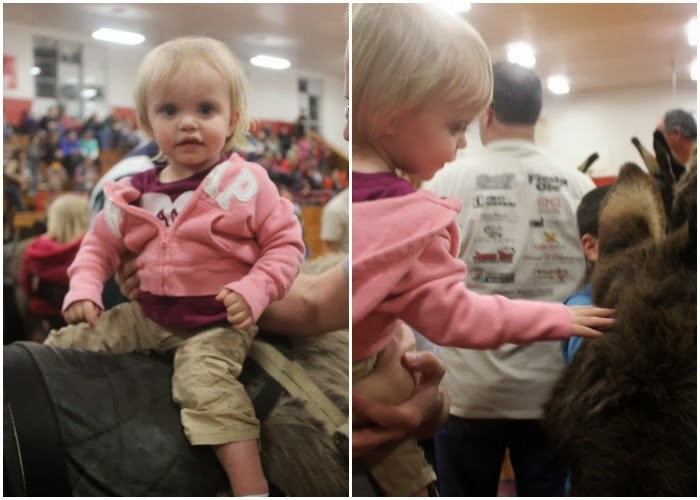 She thought the donkeys were horses. We tried teaching her donkeys say "hee-haw" but she was pretty content with a neigh. 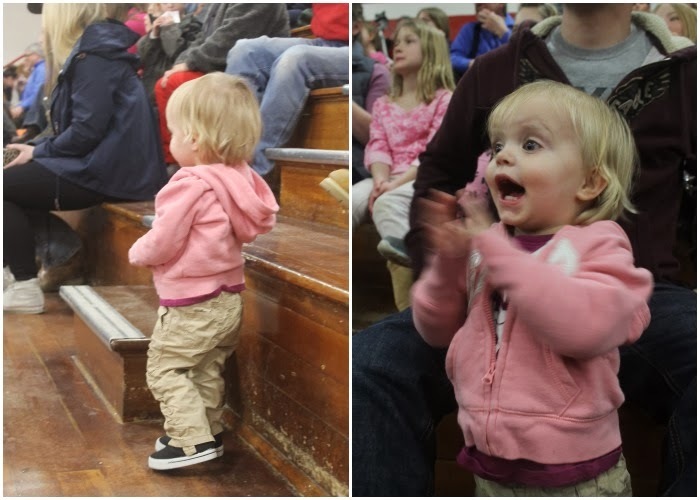 She yelled, laughed, cheered, clapped! 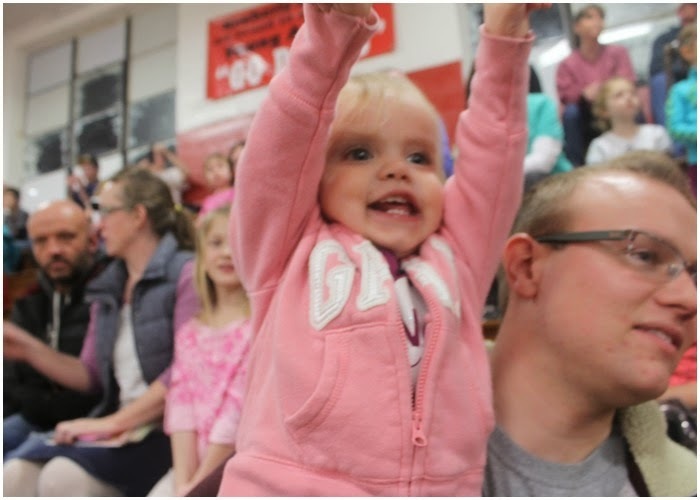 Sitting on the bleachers wasn't good enough for her. She wanted to be right up against the railing, so she could really see what was going on. She's a hoot. 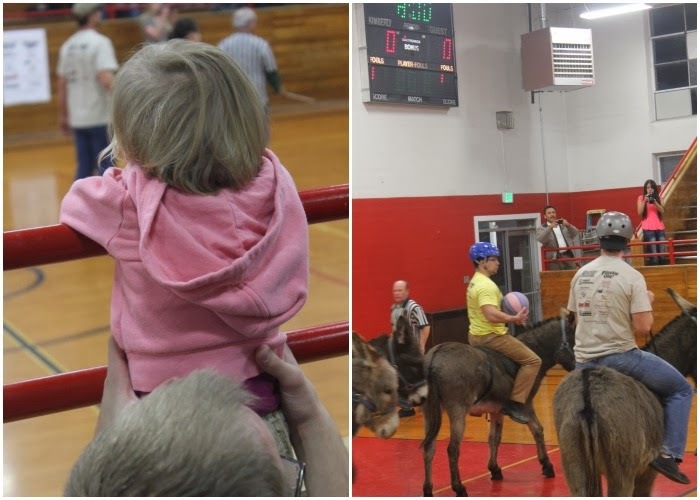 Long story short: Donkey Basketball IS a real thing and if you ever get the chance to go to a game, GO! It's root tootin good time!